After the huge success of the UR-105 CT Streamliner and the UR-105 CT Kryptonite comes a new iteration of this iconic model this time with a bronze and titanium case construction under the name CT Maverick. A watch that could very well be shaped after the helmet of a Roman Centurion , the new Urwerk Maverick is a timepiece that would evolve acquiring the patina of the owner’s lifestyle. Constructed to withstand the daily abuse of its wearer, the UR-105 CT Maverick features Urwerk’s wandering satellite hours where the hours, minutes and seconds are indicated at the front thanks to the emblematic and instantly recognizable signature element of the brand for 18 years. This carousel has been recently redesigned by Urwerk and includes the hours, minutes, seconds and a power reserve indicator that is located on the far right. A digital seconds indicator is located on the far left. The back of the Urwerk UR-105 CT Maverick reveals the two pneumatic turbines.These turbines govern the selfwinding rate, which can be set with a lever that could very well look like the safety lever on a semi-automatic pistol. In the FULL position, the slightest movement activates the winding rotor. Turn the lever to the RED —reduced— position and the turbines dampen the winding action to avoid too much tension on the mainspring. In the STOP position, the automatic winding is disengaged and the watch can be wound manually by the crown. And just like on the UR-105 CT Kryptonite to make things even more interesting, all numerals and indicators are coated with luminescent material that starts to glow at the lightest change in lighting conditions. Like a bright spaceship that fills up sky with its glow. Even when turning the watch over, there’s some lume by the movement turbines. Case: 39.5mm in width, 53 mm in length and 17.8 mm in thickness. Titanium with Bronze lid and bronze accents on movement. Water resistant to 30 meters. 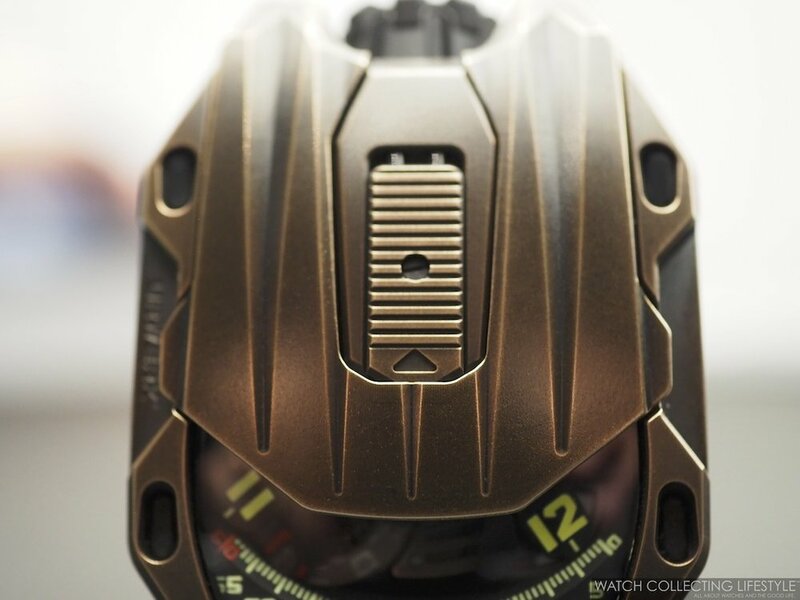 Movement: Urwerk automatic calibre UR 5.03 governed by twin turbines. This 52-jewels movement provides a power reserve of 48 hours when fully wound. Dial: Black wandering satellite hours coated in superluminova for all indications. Strap: Black alligator strap with pin buckle. Sticker Price CHF67,000 Swiss Francs —approximately $67,000 USD. For more info on Urwerk click here.